Our class will be going on our outdoor ed trip April 16th. It's a bit earlier this year than it has been in the past due to transportation availability. Please use the information below to register, if you haven't done do already. Additionally, students need to wear clothes that are appropriate for the being outside. Tennis shoes are required. Please do not allow your student to wear sandals on this trip. As students will be wearing helmets for a few of the activities, girls often find bringing a hair tie helpful to keep their hair out of the way. Please no high ponytails as the helmet won't be secure. Students will NOT be allowed to bring cell phones. All teachers will have cell phones in case of an emergency. There are also phones at the facility. Registration is done through My School Bucks. Thanks again! MySchoolBucks.com > Login > Add your student if you have not already done so > Go to School Store in upper right corner > Field Trips > GRE - 5th Grade Stone Canyon Outdoor Ed. The MySchoolBucks link can be found on GRE’s website under Parent Info or click here. Registrations MUST be completed by 2 days prior to your field trip. perspective by looking at words or phrases in the story. denominators the same so that it is easier to multiply them. In social studies/history we are working on studying travelers on a time line. discovered the Bahamas, but thought he was in the Indies. decimals and adding and subtracting decimals. have to state our claim clearly and then have reasons to support our claims. stronger, to make our claims more believable, and to add quotes. what the Natives and the Vikings did to get to America. Gold Rush welcomed Mike Nelson, Chief Meteorologist for the Denver7 First Alert Weather Team, to our school today. Our class, along with the other 5th grade classrooms and the 2nd graders learned more about the different types of severe weather and the use of a variety of weather instruments that can be used to predict the forecast. 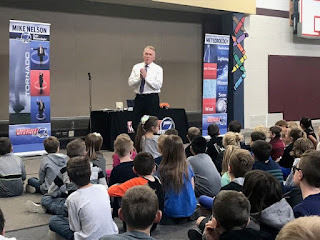 This guest speaker was able to make connections between what we have learned in class over the last few weeks to what is going on in the weather here in Colorado. It is so great for the kids to hear first hand about class topics and makes the learning that much more real and relevant to them and their lives. Tonight at dinner, be sure to ask about all the great things they learned and maybe even ask them to do the "Tornado Dance." Click here to see more on Mike Nelson. Watch channel 7 tonight at 6:00 pm for Mike Nelson's Kids Cam! In reading, we are diving into building our reading comprehension using complex nonfiction texts. text sources, and compare how different authors present information in a variety of ways. around the world. 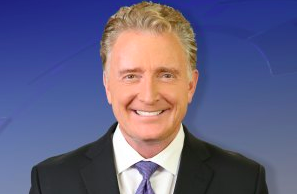 Mike Nelson form Channel 7 will also be coming in to give a presentation for the kids! kid who will be revealed to Gold Rush students on February 7th. Wish week will be February 8th-16th. foundation and will also serve as admission into the following activities. Click Here to Order a T-Shirt - Order by February 7th to get the most out of your purchase. Shirts will be delivered to Gold Rush daily, the week of February 4th. Kindness is the Gold Rush Way! During Kindness Week Gold Rush students are encouraged to spread the culture of kindness. This year we will join the Parker Police Department in their Cram the Cruiser Food Drive for the Parker Task Force. Together we can help kids in need while spreading kindness! we want you to know everything about it! READING: In reading we have been working on nonfiction text. in our reading notebooks to keep track. are doing grid coordinates by doing X axis, and Y axis. we learned about condensation as well. dancing fun games and more!